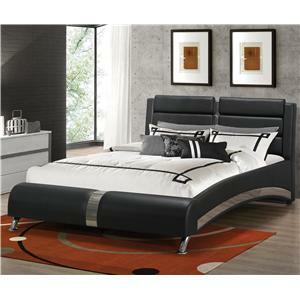 Black leatherette presents this upholstered platform storage bed with a sleek look for a contemporary bedroom decor. The lift-top hydraulic bed frame allows for easy access to a large, hidden storage space beneath the bed. Maximum bed weight: 600 lbs. 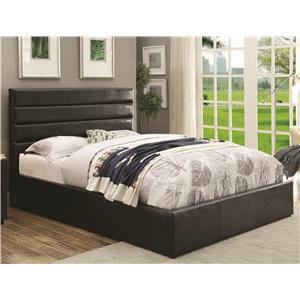 The Riverbend King Black Leatherette Upholstered Bed with Lift Top Storage by Coaster at Value City Furniture in the New Jersey, NJ, Staten Island, Hoboken area. Product availability may vary. Contact us for the most current availability on this product. 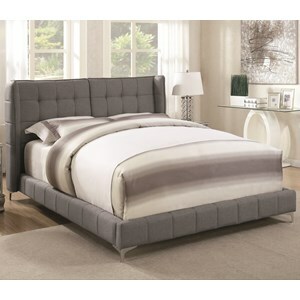 300469KEB2 King Bed Box 2 1 0" 0" 0"
300469KEB1 King Bed Box 1 1 0" 0" 0"
Browse other items in the Riverbend collection from Value City Furniture in the New Jersey, NJ, Staten Island, Hoboken area.